Love animals and parties? Then plan a Safari Theme Adventure. Create a jungle setting in your backyard or go on location to a zoo or park. Use animal print invitations and tableware as well as jungle style decorations such as tiki torches and tropical plants to set the mood. Set out pith helmet, binoculars and exotic maps as final touches. Foods and drinks with a tropical or Asian flare are ideal and fit with the theme. 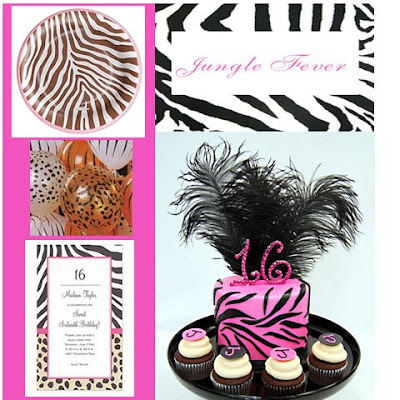 Go wild with your cake and carry the animal print theme here too. This entry was posted in Cake, Decorations, Party Tips, Recipes, Tableware and tagged Animal Print, Balloons, Cakes, invitations, Jungle Theme, Paper Plates, recipe, Safari Theme. Bookmark the permalink. we do zebra print nails at our teen parties! this would be so much fun if we included this! how cool! I tried your fruit salsa recipe and it turned out to be very yummy. Thanks for sharing.